Im going to take a quick break from the Q&A for today to share some photos I snapped this weekend. We had some guests over (one of which I'll be sharing more about later this month) so I had an urge to do a little bit of sprucing. Since I haven't been happy with how it looked, I changed up the bookcase. Remember how I was struggling with it last year? I feel much happier with it now. Not perfect but better. It would look better if I didn't own any mismatched books or didn't have to store a mishmash of stuff on the right - but I do live here so I wasn't about to make it completely impractical. It was a pretty quick fix - I added a couple of larger pieces, pulled out some of the smaller and left some empty space between the vignettes. And yes, I do have a monkey vase. My brother got it for me for Christmas after I spotted it on Apartment 412. I moved my beloved typewriter to a spot of greater honor, the coffee table bottom shelf. Looks much better paired with the vintage cameras, don't you think? Edited to add sources: Graham & Brown Wallpaper, Cotswald, Paint Color on Bookcases is Benjamin Moore Lacquer in Silver Fox, Monkey Vase from Home Decorators. ohhhh - i ADORE the paper you used for the lining of the back of your shelves - is that wallpaper or wrapping paper? scrap-booking paper??!!? its STUNNING!! I love that little monkey...it's too friggin cute. Your house is amazing. Love your style! Thanks for sharing these pictures. Is that the Loring Sofa from room and Board? I have it in brown. I also paired it with a brass coffee table. I thought it would look weird with the silver feet of the sofa. But it looks great! I love your blog! Love your bookshelves!! Did you do line the back yourself? With Paper? Or Wallpaper?!? I'm dying to get the same effect on my less than glamorous ikea bookshleves! What paint color combo is the bookshelf(and walls)? Love the mix of warm and cool gray! definitely love the typewriter on the cocktail table! Love your new changes, especially the new typewriter location- that is perfect! looks great! the cameras and typewriter look especially nice against the mirror -- love that coffee table. So pretty. You could cover your books with kraft, wrapping, or wall paper to achieve a pretty and tied-together look. The larger items really help it look more purposeful and less cluttery. Great idea with the typewriter! I LOVE the wallpaper....swooning over it! Just lovely! I would be happy to spend any time in that guest room. So even though I'm local to you I want an invite. I just finished up my guest bedroom and revealed it today so we can swap and I can have you over here as well! I too can't wait to hear about this mystery guest. Love the new home for the typewriter. I love the typewriter on the coffee tables also. And I'm so jealous of your bookcase! It looks fabulous. OMGosh! Love the home you chose for the typewriter... LOVE it!!! The monkey vase is too cute! The typewriter paired with the cameras makes a wonderful little collection. You have a beautiful home. I'm so in love with it! I really like the monkey vase. Very jealous of the typewriter. So, cool. I know everyone above me has already said it, but the typewriter and cameras displayed in such an interesting way took my breath away. Great touch! I am a fan of the monkey. Can you tell me where you found your sofa and chairs? I am sorry if you have already answered this for someone. Thanks for sharing with the Q&A. I remember how difficult it was for you to finally get the coffee table. It was well worth the wait. Totally love the look of the bookcase as well. I have always loved those shelves Stef - and love your monkey vase. Sorry I have not been by much - being a very bad visiting blogger lately. Hope you are well and I do drop by for a quick peek often, as yours is still one of my top blogs!! I just don't comment as I am usually checking from the office. But wanted to stop by and say hello! Oh it does look really good. I love shelves that are built in. I love the color of the bookcase and the pattern on the back. The typewriter with the cameras makes for a great vignette! Simple but striking. I love your nook with the built in shelves....looks great! Love the color and the papered background.  I am in LOVe with your Brownstone...wish I could find one to buy in Texas!!! I know...I am dreamin'! i'm loving this room, especially the shelving. genius. hope you're having a lovely week my dear! LOVE where you put the typewriter. What a conversation starter too! I have been following your blog daily for about 4 weeks now. Can't get enough! The typewritter idea on the glass coffee table is an unexpected idea. My 14yr old son collects old typewritters, up to 6 now....I have one on top of old stacked suitcases in the living room. love the monkey - it was the first thing i noticed! Im glad my monkey vase is popular. I thought a few people would hate it. Mr. Limestone certainly does! Amy R: The sofa and chairs are from Room & Board. Love the blog and the place looks great, I'm in the middle of my own massive rehab so its great to see some of the choices you're making as I do the same. Ok...you had to know someone would ask...what's the color on the bookshelves? You're amazing... i love your blog and the work you do.... my favorite are yours project photos. I'll certainly be borrowing your ideas (with credit given to you of course) I'm always looking for new ways to spruce things up and give cool gifts... thanks so much for sharing all that you do. Love love love the bookshelves - can't say it enough! Simply perfect! Your style and house are amazing! I love the look! And I think I am in love with your typewriter!